Moogfest is an annual 4-day music festival and technology symposium featuring artists whose music uses Moog instruments or ideas. It began a decade ago in memorial of Robert "Bob" Moog, the inventor of Moog synthesizers. 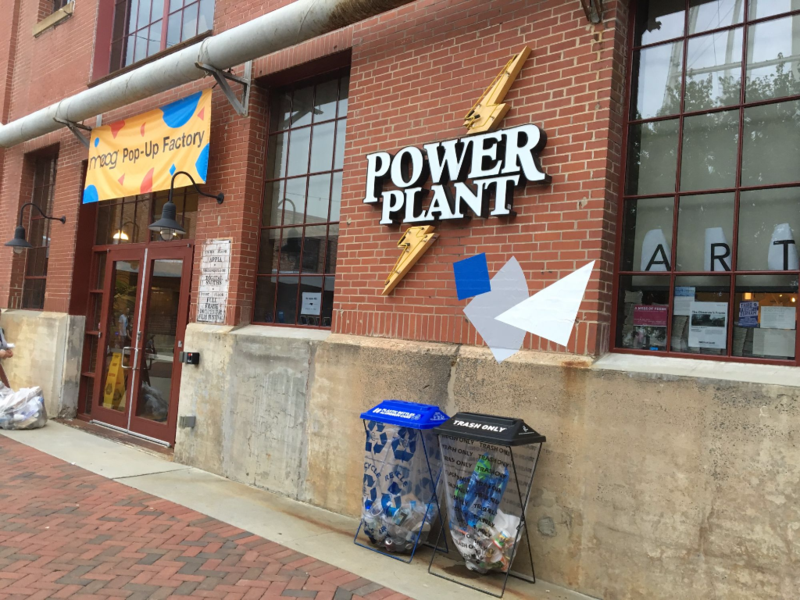 This year Moogfest was held in Spoonflower's home city of Durham, North Carolina! With all the music and tech chatter surrounding the festival, Spoonflower was overjoyed to have the opportunity to provide the signage. Our Woven (peel and stick) Wallpaper was selected by Moogfest organizers as the festival's signage material because of its versatility––it can adhere to a huge range of surfaces and can be peeled off and repositioned multiple times with minimal loss of stickiness. 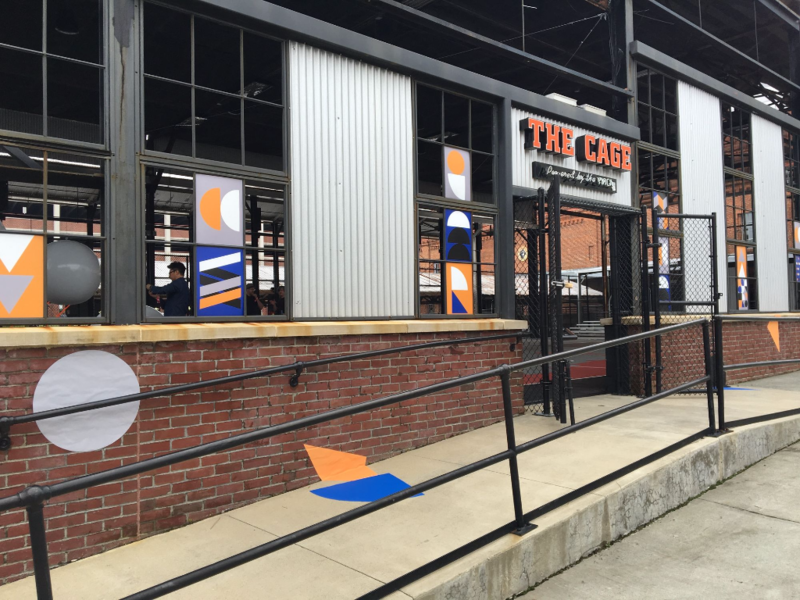 With venues scattered around the urban landscape of downtown Durham and surfaces ranging from corrugated steel, brick, and concrete surrounding festival-goers throughout, our Peel and Stick was put to the test. We are happy to report that it held up great, even through the sun, rain and wear-and-tear of constant festival traffic. 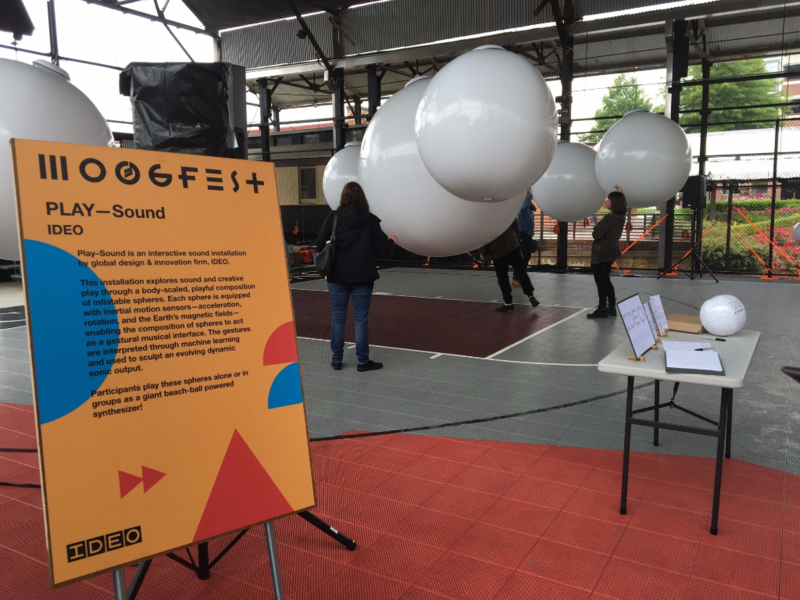 In the spirit of art and innovation, Moogfest organizers chose to print their official colors, cut out simple shapes, and playfully stick them to the surfaces around venues, as if handfuls of oversized confetti had been sprinkled about the entrances. We loved how much these bright shapes enlivened local Durham landmarks. Even signage as simple as a rectangle banner can be difficult to set up when identifying anchor points or wrestling windy conditions. 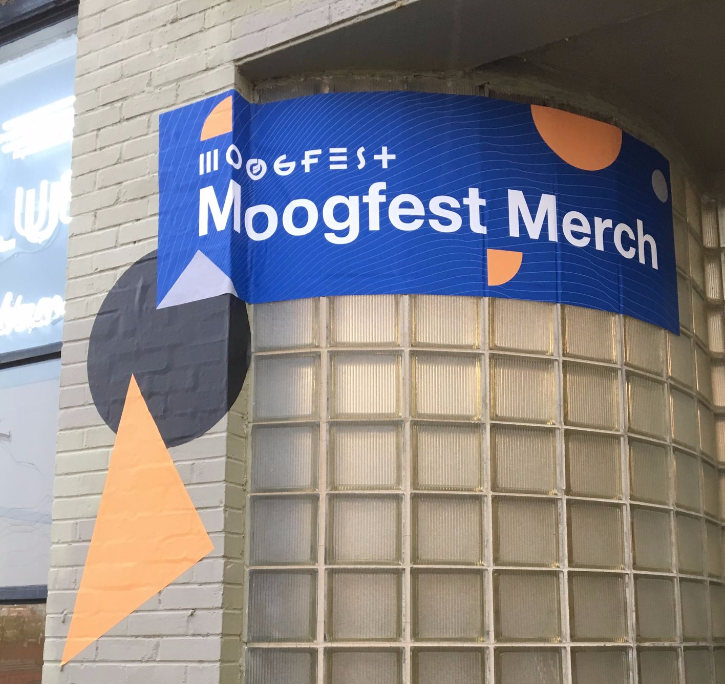 Since Peel and Stick doesn't need rope, grommets or bungee cords (since the banner is essentially a giant sticker), Moogfest's organizers had much more freedom to attach their signage. 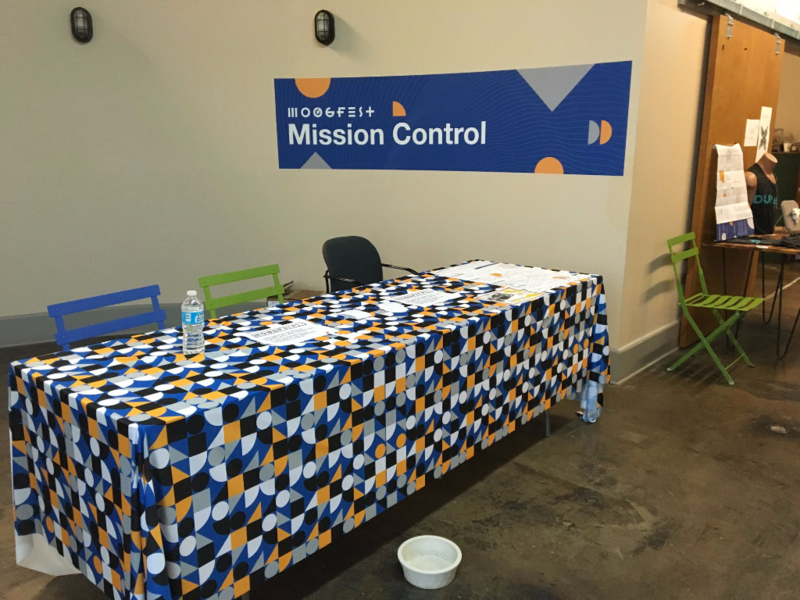 One of our favorite applications was this merch banner which started on concrete and bent around the curving glass blocks of Moogfest's mission control and merch area. Moogfest check-in stations were also decked out in custom printed tablecloths, so attendees, artists, and volunteers alike could easily spot where to go. Easels throughout the festival explained various workshops, displayed the daily schedules, and showed maps of downtown to help attendees get around efficiently. The custom signage showed festival attendees where the music and technology workshops were taking place each day. Numerous buildings donned Woven Wallpaper signage on all weekend through the rain and sun, making it an ideal material for event signage in outdoor, multi-day settings. 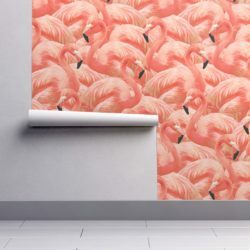 For other similar project ideas, see our past blog posts about Woven Wallpaper calendars, and fabric party banners. 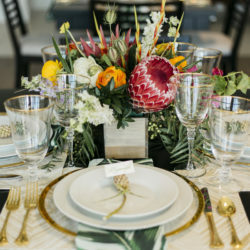 How the Spoonflower Community is Embracing Pantone’s 2019 Color of the Year – and How You Can Too!